Brett Martin’s extensive range of authentic hopper styles and designs provides the opportunity for the designer and home owner to individualise their rainwater system. 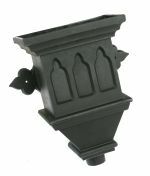 The hopper designs include traditional Ogee, Bath and Gothic hoppers with a choice of period motifs including Tudor Rose, Fleur de Lys, Lion and Gargoyles. Plonk this in a 60-70mm outlet and you will prevent the majority of leaf debris from entering your pipe system. Plonk this in a 71-90mm outlet and you will prevent the majority of leaf debris from entering your pipe system. Plonk this in a 91-110mm outlet and you will prevent the majority of leaf debris from entering your pipe system.